Budapest, between July 4th - 14th, 2011. 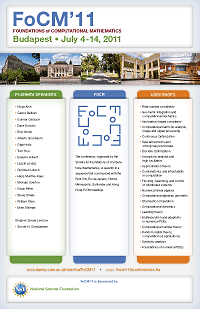 The conference, organised by the Society for Foundations of Computational Mathematics, is seventh in a sequence that commenced with the Park City, Rio de Janeiro, Oxford, Minneapolis, Santander and Hong Kong FoCM meetings. The conference will follow a format tried and tested to a great effect in former FoCM conferences: plenary invited lectures in the mornings, theme-centred parallel workshops in the afternoons. Each workshop extends over three days and the conference will consist of three periods, comprising of different themes. Although some participants choose to attend just one or two periods, on past experience the greatest benefit follows from attending the conference for its full eleven days: the entire idea of FoCM is that we strive to break out of narrow boundaries of our specific research areas and open our minds to the broad range of exciting developments in computational mathematics. Each workshop will include a daily "semi-plenary" lecture, of an interest to a more general audience, as well as (typically shorter) talks aimed at more technical audience. The choice of speakers in a workshop is the responsibility of workshop organisers. Many (but by no means all) workshop talks will be by invitation. International Mathematical Union, Commission for Developing Countries.